A breviary is the prayerbook compiled especially for the daily prayer services (divine office or hours) of monks and nuns. Monks and nuns recited psalms and prayers, read aloud excerpts from the Bible and commentaries in a series of services every day at set hours, beginning very early in the small hours until bedtime, which was at nightfall. The prayers for each day of the year were different. The breviary contained all of the texts needed for the divine office. This breviary belonged to the English nuns of St Brigitta (or Brigittines) whose house, Syon, was originally located near Twickenham. After Henry VIII dissolved Syon in 1539, the Brigittines wandered in the Netherlands, France and Spain, eventually settling in Lisbon. The prayers on this page form part of the Office of the Dead: prayers recited on the day of burial of a member of the community or someone connected to it, such as a benefactor. 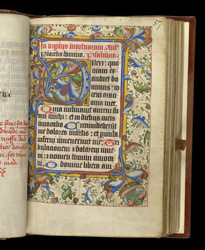 On the facing page, an inscription asks for prayers for the souls of the parents, John and Margaret Edwards, who had the breviary made for their daughter, Elizabeth, a nun at Syon.